Born at the end of Napoleon’s reign, Eugène Ciceri spent his formative years in an extended family of painters. His father, Pierre Luc Charles Ciceri (1782-1868), painted grand decorative murals and stage sets, and served as the designer of official ceremonies following the Restoration of Louis XVIII in 1814. 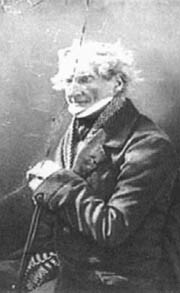 Young Ciceri learned the basics of his craft from his father, and subsequently from his great-uncle Jean-Baptiste Isabey (1767-1855) who enjoyed extensive patronage under Napoleon as well as the royalist rulers of the 1820s and 1830s. Isabey’s son, also named Eugène, was only ten years older than his nephew Ciceri, and proved to be a lifelong artistic influence and friend. Like many young men, Ciceri seems to have traveled overseas in his 20s, perhaps as part of his military service. Two watercolors from 1837 depict unspecified Caribbean landscapes that might well be scenes from French territories such as Martinique, Haiti or St. Martin. On his return to France, he followed in his father’s footsteps as a decorative painter, and undertook a large mural commission for the civic auditorium at LeMans. The grand opening of this public work took place on 13 May 1842. However, it seems to have been the last time that Ciceri accepted a mural commission on this scale. Instead he turned his attention to the landscape painting that his uncle, Eugène Isabey, was exploring. During this period, Isabey and Ciceri shared living quarters in the Parisian Quartier Pigalle where they were both influenced by their neighbors Théodore Rousseau, Jules Dupré, Narcisse Diaz, Johan Barthold Jongkind, and Jean-François Millet. Ciceri’s landscape painting, which became the basis for the rest of his career, reflected the concerns typical of these innovative artists: preservation of France’s rural landscapes; awareness of the sanctity of labor; and the encroachment of industrialization on a once bucolic environment. 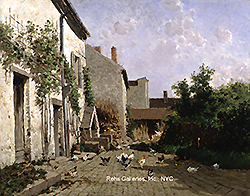 Not surprisingly, he made his Salon debut in 1851 at the exhibition now recognized for admitting the previously unwelcome Realist and Barbizon artists. The following year Ciceri won a third class medal for his riverscape entitled Vue Prise au bord du Loing. He continued to exhibit paintings at the annual Salons throughout the 1850s, switching to lithographs from the 1865 to 1882. Ciceri’s landscape painting evolved in concert with emerging modernist developments of the Second Empire and the Third Republic. Travels to North Africa produced exotic images such as Oriental Market from 1869 or River Bank in Turkey in 1877, and a set of twenty-five color lithographs for Marius Fontane’s 1869 book, Voyage pittoresque à travers l’isthme de Suez, (Paris, P. Dupont). However, the primary focus of Ciceri’s work remained the landscape of France, particularly the region surrounding Paris and the countryside of Normandy. By the 1870s, his color palette had brightened and his subject matter became increasingly concentrated on the formal and tonal relationships between sky, water and earth. 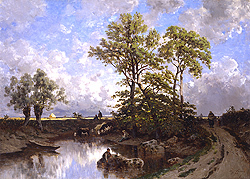 Traces of the Barbizon aesthetic remain in the images of working men and women who fish and wash clothes and drive carriages, but attention to atmospheric effects and colored light suggests the growing influence of Impressionism; and like his uncle Isabey, Ciceri created skies that were vast and full of movement. Still painting at age 77, Ciceri died at the village of Marlotte near Fontainebleau on April 22, 1890. Since his death, Ciceri’s paintings have generally followed the market trends for Barbizon and Realist art, falling dramatically in the 1920s and 30s, but rebounding solidly in the 1970s and continuing to grow today. His works are on display in public collections throughout the Europe and the United States, including the Louvre, the National Gallery in Berlin, the Getty Museum in Los Angeles and the French national museums at Châlons-sur-Marne, Chartres, Le Harve, Limoges, Mulhouse, Perpignan, and Troyes.